1. Reeves wanted to shoot anamorphic, in part because of the narrower depth of field. But Reeves was told he couldn’t shoot anamorphic because the lenses didn’t match closely enough for 3D work. He then decided to frame 1.85, so that he would use longer lenses for the same horizontal composition than if he had shot widescreen, and therefore achieve less depth of field. 2. 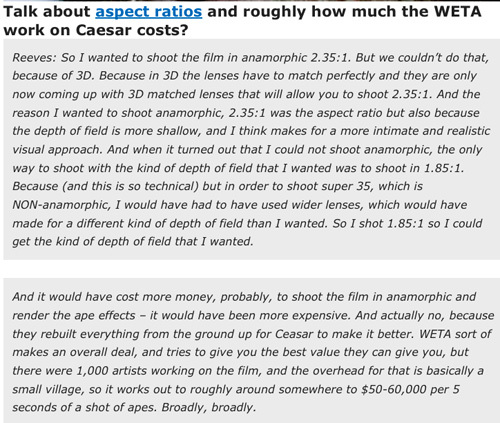 Reeves roughly estimates the cost of a 5-second shot of virtual apes to be 50-60 K dollars. The apes were rendered with performance capture by Peter Jackson’s New Zealand VFX facility, WETA.